At the juncture of Fujian and Jiangxi provinces, the Mt. Wuyi Nature Reserve covers an area of 570 square kilometers and is the largest continental subtropical forest ecosystem in southeastern China. It is a class-one nature reserve and is part of the UNESCO Man and Biosphere Program. It is a famous paradise for birds, a kingdom of snakes, and a world of insects. It has towering peaks. Mt. 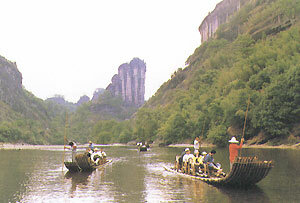 Huanggang stands 2,158 meters above sea level. It is the highest of the reserve and is praised as the "roof of eastern China" Streams cross each other and waterfalls crash onto the bases of steep cliffs. The well known Nine-Bend Stream seems to eternally cross the reserve, winding to and fro. The forests are home to many rare animals. Ancient trees and fantastic flowers provide a peaceful environment for beautiful silver pheasants and monkeys as they struggle beside man for survival. A visit to this reserve is truly a journey back to nature.